Last year, the company was named by Inc. Magazine as being one of the top 5,000 fastest growing companies in the USA, something that came about just months after the company announced its line of corporate gift coolers and jugs stuffed with beef jerky. Whether that had something to do with its position in the top 5,000, one can only speculate. 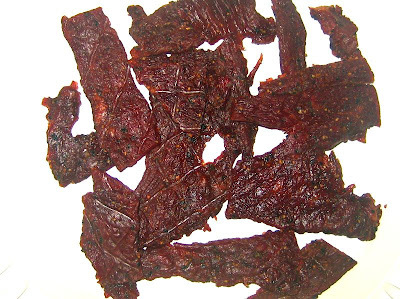 Choo Choo R Snacks makes a Western Cut line of thin and dry jerky, as well as a Premium line, in addition to meat sticks, slab jerky, shredded jerky, and jerky circles. The sweetness of the sugar and honey is probably the very first taste I notice, followed soon after by the black pepper. There is also a saltiness that comes through, and the garlic taste is also noticeable. The sweetness is not heavy, it's not like the "meat candy" description I used in a couple of other brands I've had. It's a light sweetness that I notice mostly in the first several seconds. When going into the chew, I don't really notice it anymore. The black pepper taste is much more defined. I taste it almost immediately and it becomes stronger the longer I keep a piece in my mouth. This variety almost has a barbecue sauce taste, probably a culmination of the honey, paprika, garlic, and pepper. As I continue to soften up piece in my mouth, and extract the juices, it has a barbecue meat flavor. The natural meat flavors are not as easily detectable in this variety than in the other Country Cut varieties I've reviewed from Buffalo Bills. For one, this Honey Pepper variety has a lot of flavor packed in, with the black pepper, salt, and garlic. But like I said above, if it's there it's mostly there as a barbecue meat taste. As for that saltiness, it's certainly salty. There is plenty of other flavors that come through to help offset it, but it's still a dominant flavor. Overall, what I taste in the forefront is the black pepper, saltiness, and garlic. The natural meat flavors tend to take on a barbecue like quality. 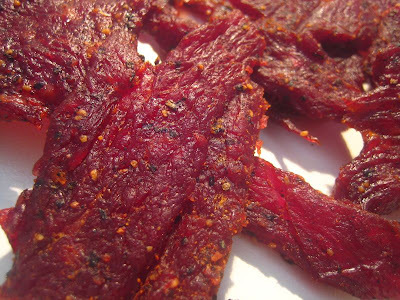 Otherwise, it's a very tasty beef jerky. This is a semi-moist variety. The pieces tear apart easily, and they chew easily. As a soft and tender variety, this particular review sample is not quite as soft and tender as the company's other Country Cut varieties I've had. But it's still easy to eat. Choo Choo R Snacks sells this Country Cut Honey Pepper variety from its website at a price of $5.49 for a 3.5oz package. That works out to $1.57 per oz, putting this into the average price range. For that price, I'd say this offers a great value. It's packed with flavor that lasts throughout the chew, it's easy to eat, and lives up to its advertised flavor. As a honey pepper variety, it's still more pepper than honey, but it does have a noticeable sweetness, mostly in the first several seconds of eating. If I was a honey jerky fanatic, I'd expect more sweetness. It also has a great snacking quality that makes me want more. This Country Cut Honey Pepper variety from Buffalo Bills offers a great taste contrast between sweet honey and spicy black pepper, with an almost barbecue-like meat flavor. The meat is easy to tear apart and chew and contained no tendon or gristle to get in the way. Put those qualities together and it creates for a very snackable jerky. While I found this to be salty, I enjoyed the other flavors enough that it didn't demand my attention too much. It certainly could be more sweet since it does advertise itself as a honey variety. Folks who love sweet jerky might be disappointed in this. But for general beef jerky enjoyment, I found it very enjoyable.